At the Office of the Public Guardian (OPG), we want everyone to have the opportunity to plan for their future on their own terms, with the people they trust the most. We want everyone to be aware of how they can do this with a lasting power of attorney (LPA). That’s why we’re launching the pilot phase of our campaign – your voice, your decision - to raise awareness of LPAs and counter some of the common misconceptions around them. To inform our campaign, we conducted research into how many people across England and Wales currently have an LPA and compared this to areas of deprivation and dementia prevalence. This showed us that there are people in our society who could benefit from having an LPA but don’t have one or know about them. Our research also told us that those who know the least about LPAs tend to be from a lower socio-economic background and are more likely to be impacted by health issues or age-related illnesses such as dementia. We learned that nearly 75 percent of people think that their partners or close family members can automatically make decisions for them if they’re not able to. As next of kin, many people expect that making medical decisions or future planning for loved ones is straightforward. This is not true; only an LPA gives you the legal ability to give those you trust the power to make decisions on your behalf if you lose mental capacity. Taking this information we gathered we developed a campaign plan to tackle these common misconceptions. 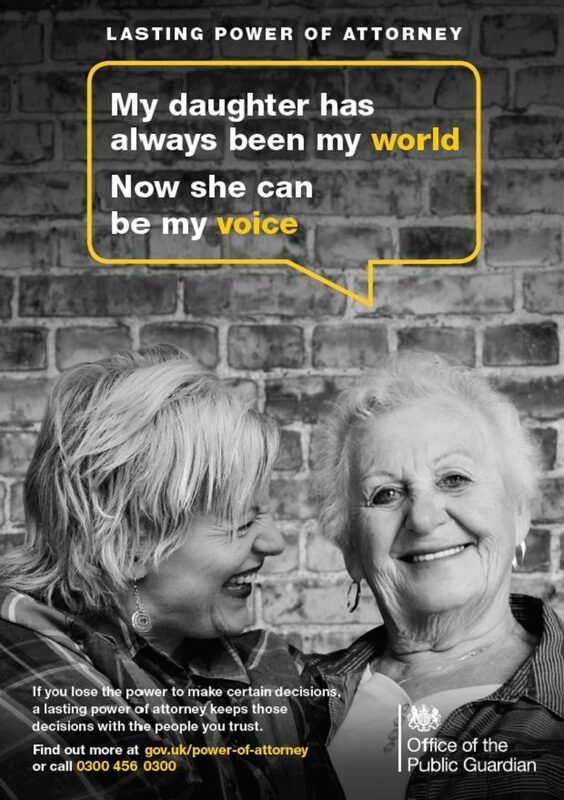 Our campaign – your voice, your decision – aims to provide access and information about LPAs to everyone, and encourage everyone to take them out to provide peace of mind for the future. To test the effectiveness of our campaign, we’ve deliberately started small. We’ve chosen to kick off our pilot in the London Borough of Islington. We chose this area because it’s an area with a low take up of LPAs and while it has an affluent community, the borough also has many people living in poverty. We’ve worked closely with local organisations to develop our campaign plans including Islington Borough Council, Islington Clinical Commissioning Group, Age UK, Camden and Islington Mental Health Trust, and Islington Mind. It’s been a brilliant example of cross-agency working in the safeguarding community. Leaflets and posters are available in Islington GP surgeries and hospitals as well as Age UK community centres. We’ve also developed a campaign website to act as a single point of contact for our online channels. We’ll be running our pilot over the next few months. We’ll then evaluate our objectives to learn what’s worked well and what we can improve. In collaboration with our partners, we’ll use this information to inform our work in other areas of England and Wales. If you’d like to find out more about LPAs visit our campaign site. Why is it you make no mention of seeking independent legal advice to safeguard the vulnerable and elderly? You must be aware of STEP and SFE whose membeships comprise specialist solicitors in this field who are experienced in the complexities involved and offer objective advice and assistance to those in need of help. Thank you for your comment. It is possible for people to apply for lasting powers of attorney online without the need of a solicitor so we want people to be aware of this option, especially if they're eligible to apply for remissions and exemptions as they may not be able to afford a solicitor. However, we would always recommend that someone seeks legal advice if they have complicated finances or specific wishes as part of their application. Thank you for your response but you are missing the point. Ease of electronic application leaves the vulnerable and elderly at risk from unscrupulous relatives or others. As you will be aware the courts have been required to imprison assorted people including sons and daughters who have taken improper advantage of an LPA. There is also a significant cost element to judicial proceedings which can only increase if appropriate safeguards are not in place at the commencement of the LPA process. It is therefore not only desirable but necessary, to ensure the donor is aware of the full implications of an LPA and is not under undue influence, that independent legal advice is given to the donor by qualified legal professionals who are experienced in this field. In the rush by the government departments to digitise everything on the altar of cost the wider implications are being overlooked or ignored to the material disadvantage of the general public. This advice should form a significant and well publicised part of any press release or information you offer to the populace or you are failing the very people you should be protecting. Hi Kenneth, Thank you for your comment. OPG do a lot of work with solicitors, will writers and other professionals and we do not discourage people from using these services. These services are some of our most important stakeholders but they can also be costly to citizens. Our campaign is focusing on lower socio-economic groups who cannot afford such legal advice and also likely do not have complicated financial estates or assets. It is recognised that LPAs are powerful deeds and OPG sets out very clearly that people should take great care when choosing someone they trust to act on their behalf. Guidance is provided on GOV.UK and there are other inherent safeguards in place. It is vitally important that people choose someone they trust to act on their behalf. LPAs only come before a judge when things have gone wrong. With the vast majority of LPAs there is no abuse. We are not complacent about the potential for fraud or misuse of powers. Based on the year 2017/18, concerns and investigations remain a comparatively tiny percentage of our overall registered caseload - 0.16% for concerns raised and 0.06% of concerns investigated. In the context of over 3.5 million LPAs on the register, misuse is thankfully rare. In terms of our fees, OPG runs at cost-recovery which means any money made goes back into the business. I have read your post and visited your campaign site. As a solicitor specialising in private client law and having seen many vulnerable people being financially bullied or abused by family, I am extremely concerned that at no point is there a suggestion that a person may benefit from receiving independent specialist legal advice. Indeed I note that you suggest that a person can ask for someone to make the online application for them if they do not have access to a computer. The average GP is no longer prepared to act as Certificate Provider removing yet another possible safeguard. I note that there is absolutely no reference in here to the option for individuals to seek legal advice if they feel it necessary. As a fully qualified member of Solicitors for the Elderly and STEP, I often end up having to pick up the pieces of those who have tried to prepare these documents themselves but have either then had them rejected by the OPG and they then have to pay the fee yet again, or who have not appointed their Attorneys as they had thought and we then either have to start again, or it is too late and the only option is Deputyship. It seems that without alerting individuals to the possibility of requiring legal assistance the OPG are benefitting from additional fees being paid when mistakes are paid. There is also the increased risk of fraud or undue influence - surely there should be some form of caution advised here. I do think the excessive costs charged by solicitors for a 'routine procedure' such as an LPA puts the average Joe Public off. These people mention excluding the GP. Have you tried to see a GP? Let alone ask for some administrative task to be done by them! As for family... if they are going to bully/intimidate an elderly/vulnerable person, I doubt that many solicitors would pick it up. Looking at previous comments offered on this OPG site, not once did I notice a solicitor offering an 'across the board' reduction in fees for something which no longer requires a Law Degree, just simple skills such as reading & typing. Even the OPG have exemptions/remissions on their already reasonable (when compared to a solicitor) fees. Well done OPG., perhaps the odd 'follow-up' letter could be sent to the donor to ask if all is well with the execution of the LPA. Thank you for your message, it is much appreciated. I will pass along your message on the 'follow-up' letter to the relevant team, we're currently looking at ways we can improve our service for customers and feedback is always helpful. Thanks for responding and letting me know what action you have taken. When I said a follow up letter, it could be a random selection, telephone call, visit even. I do not believe it should be a matter of rote, (everybody gets a follow-up after 3 months). Random selection, random times (even up to 5 years later) would be the best bet. This would involve minimal cost, unless no response was received from the donor. I would like to pick up a point that Jacquie makes above. The fees that professionals charge are not simply for the 'routine procedure' of completing an LPA. While it is relatively straightforward to complete the form - yet still possible to get it wrong in many different ways - the benefit of advice could be for those who are unsure how their attorneys should act, what additional wording they need if they have assets under discretionary management, what the risks are if you don't register the document immediately. That's to name just a few issues that a professional could address. The value of seeing a professional is in the advice that they give as much as in the completion of the forms.